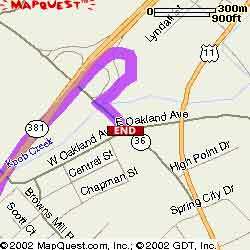 Take the TN-381/STATE OF FRANKLIN RD exit- exit number 36- towards BRISTOL. At 4-way stop at intersection with Lakeview, continue straight. Turn left onto 9th Street (at Rotary Park sign). Turn left, and right into Civitan Park.